If you have difficulty running these videos in your browser, please view this page in Internet Explorer. 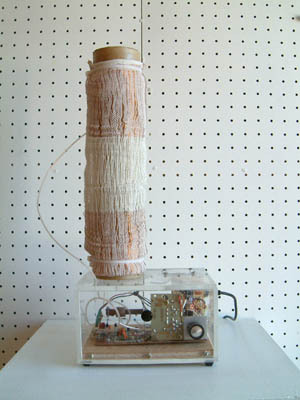 Each piece in the Dialectric series consists of a textile woven by Laura MacCary of conductive or resistive materials cast off by industry, and a circuit designed around that textile by Lawrence MacCary, except in the case of Plutarch, which was designed my Lawrence and Laura wove a textile for it to his specification. These woven structures form simple electronic components, such as coils, potentiometers, and switches. In each piece, by interacting with the woven component the viewer physically enters the circuit, and the circuit passes through the viewer. The title of the series, Dialectric, is taken from the words dialectic, meaning the juxtaposition or interaction of two conflicting ideas or forces, and dielectric, an insulating substance (frequently air) or a substance in which an electric field can be maintained with a minimum loss of power. I see these as metaphors for the participants in an interaction, and the space between them. Dialectric: I and Thou is woven from discarded reel-to-reel audio tape and nichrome wire. When the viewer touches the fabric, the circuit is closed though conductance through the viewer's hand, and the circuit generates an audible series of clicks. The frequency of the clicks is determined by resistance, which can be changed by providing more or less skin surface area. As more surface area is applied, the clicks merge into a tone. Click on the picture to view an 809 K MPEG video with sound. Dialectric: The Space Between Us is a Theremin, which is an electronic musical instrument invented in 1929. This variation of the instrument was developed by Lawrence MacCary to use coils handwoven from copper wire. In the original version of the instrument, antennas connected to coils hidden inside the case detected capacitance changes caused by the musician's hand. This version does away with the antennas and brings the coils out of the box for the viewer to interact with directly. The viewer's hand enters the magnetic field of the coil, causing inductance changes which can be detected and translated into sound. Click on the picture to view a 1.7 MB MPEG video with sound. Dialectric: Connection consists of a circuit board working with a fabric woven of yarn and wire. The wire areas of the fabric are woven to make touch switches, which light LEDs on the circuit board. The viewer provides the connection. Click on the picture to view a 1.4 MB MPEG video. About Plutarch, Mac says "I can tell you what Plutarch is not. It is not a Theremin, nor a metal locator, nor a proximity detector although it marries together some of the features of all of these instruments. The best description I can come up with is "Touch me and I'll tell", because that is the way Plutarch behaves. If you touch his exposed member, he will let you and everyone around know his space has been invaded. Plutarch warbles and wails when touched and he loves the attention." This web site and all attendant text, images, and videos Copyright © Laura MacCary.